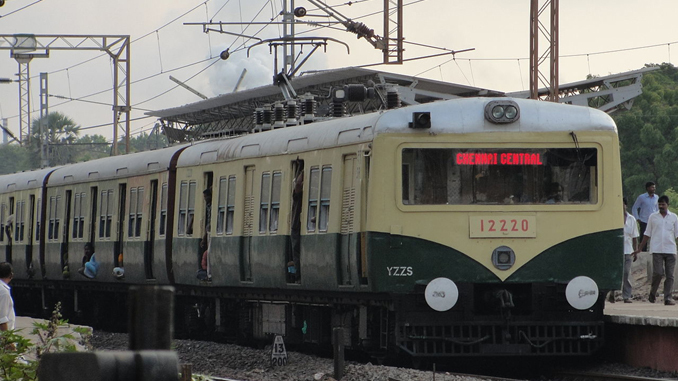 The Railway Board has approved introduction of 2 circular trains in Chennai suburban circular route and extension of 2 locals in the Tirumalpur-Arakkonam section, Southern Railway announced. The MEMU which starts from Chennai Beach at 10.30am will reach Arakkonam at 12.30pm, Tirumalpur at 1.15pm, Kancheepuram at 1.50pm, Chengalpattu at 2.15pm, Tambaran at 3.15pm and return to Beach at 4.10pm, sources said. Similarly, an EMU service which leaves Beach at 9.50am will return at 3.15pm. Enroute, the train will stop at Tambaram 10.15am, Chengalpattu 11.35pm, Kancheepuram 12.25pm, Tirumalpur 1pm and Arakkonam 2pm. On the introduction of these services, 2 passenger specials – “Chennai Beach-Arakkonam” and “Chennai Beach-Tirumalpur” trains, will be cancelled. In addition, 3 trains which run up to Tirumalpur, will be extended to Arakkonam. The additional trains would be introduced once the roundabout tour line of Takkolam and Arakkonam are open for traffic.